Martine Bertin-Peterson is intrepid; she had a window of 90 minutes of “downtime” between her back-to-back tour groups, yet she agreed to meet me for a glass of rosé. 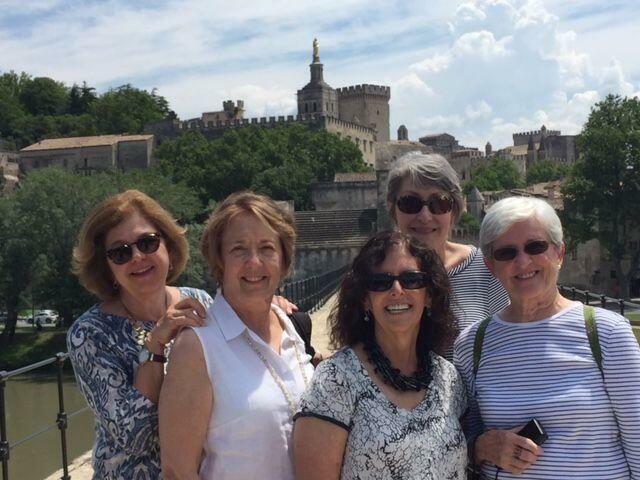 Beneath the walls of the immense Palais des Papes, in Avignon, we chatted about her food and wine excursions in Provence. 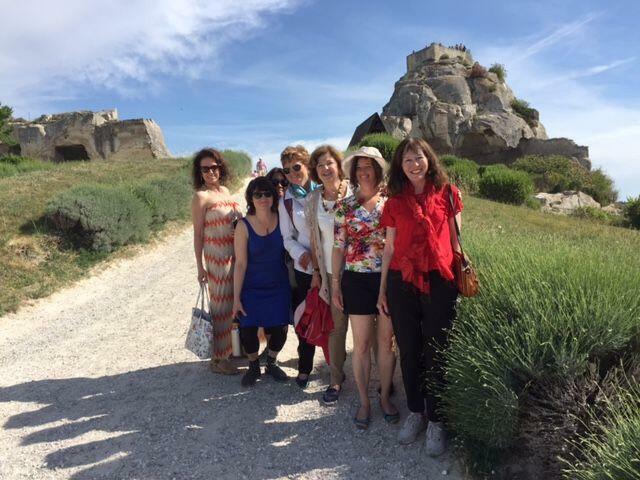 Goût et Voyage trips are like travelling with your best friends; the group size never exceeds six people. 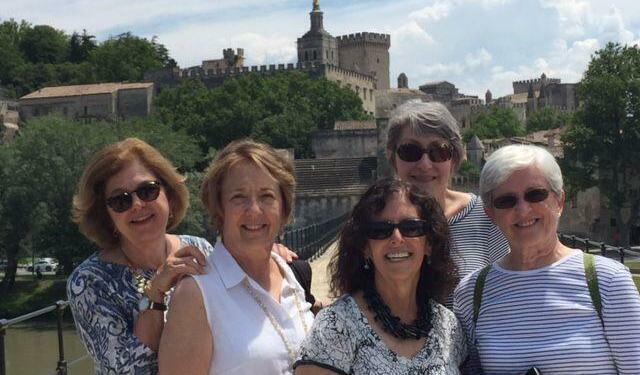 Even train strikes and lost bags are not a problem for this travel pro who has been running tours for 30 years. Born in France, Martine’s French is impeccable, which helps when there is the odd snag like a transportation delay. 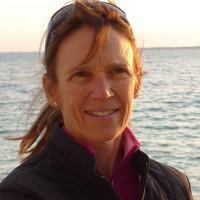 No worries, though, for this lady who has moved from a career in marketing to owning (and running) a high-profile gallery in Santa Fe to teaching marketing and management at The College of New Jersey (School of Business). Did I mention she speaks five languages? 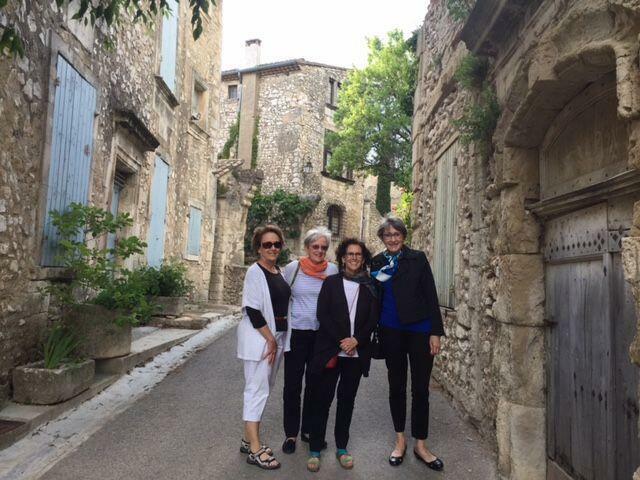 Annual Goût et Voyage trips to Provence round out Martine’s culinary and wine focus. During the balance of the year, she leads market tours and cooking classes in Bucks County, Pennsylvania. 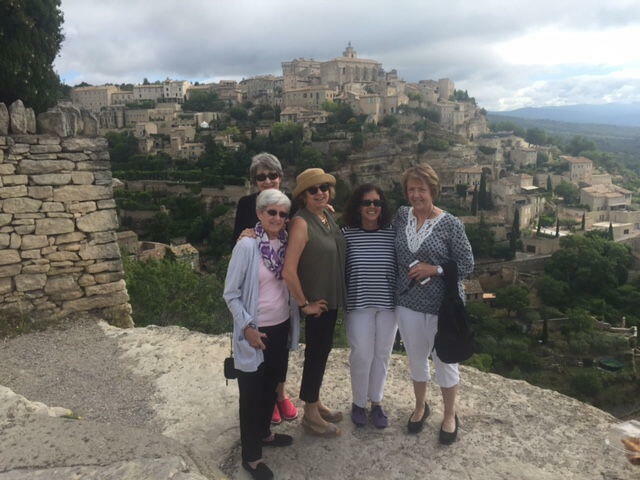 Our window of time was quickly closing, Martine had a group dinner booked for the arriving clients, and our rosé glasses were empty, but I would not let her go before she shared. How would you spend a weekend in the Luberon? La Ferme de la Huppe, a peaceful and luxurious 4-star property outside of Gordes has stunning grounds, ten well-equipped rooms, a lovely pool and a fine restaurant. The buffet breakfast will keep you sated well past lunch time. Consider renting a house in Goult, Lacoste, Menerbes or Bonnieux, which are less of tourist destinations than some of the other, more famous hill towns. 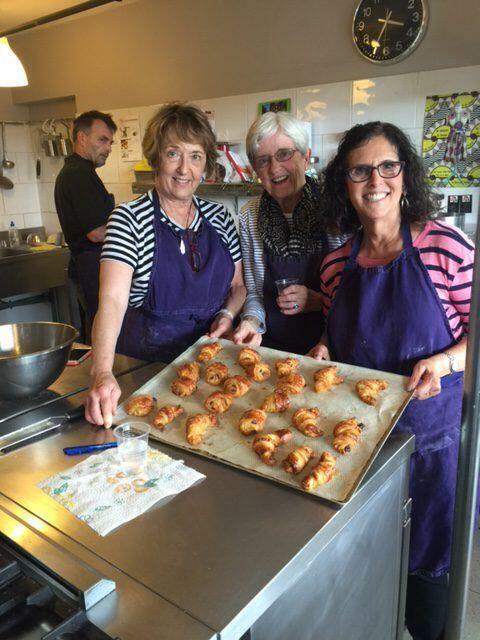 You’ll be able to pick up your morning croissants at the bakery while chatting with locals, create a lovely meal with the provisions you purchased at the market, enjoy an evening stroll through the town perhaps followed by a stop for ice cream. After a long day of touring, you can relax by the pool or try your hand at a game of boules. There are many excellent, small restaurants in the Luberon. At L’Arome in Bonnieux, you dine in a 114th-century vaulted room with old stones, contemporary lighting and a grand fireplace. When the weather is warm, you can opt to have your meal on the tiny terrace while passers-by ogle your dish selections. The chef prepares a changing seasonal menu focusing on fresh produce and fish. Don’t forget to visit the 11th-century wine cellar. In Goult, I like Aux Fines Herbes, a small family restaurant run by the charming Martine and Johan. The restaurant serves contemporary, seasonal Provencal fare. The terrace is a perfect place to dine on a warm summer evening. 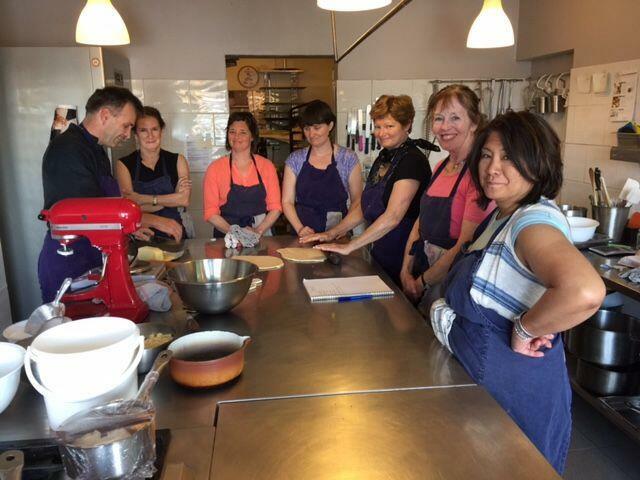 The tiny Saveurs Gourmandes, run by a husband and wife team, is located down a small street in Menerbes. The menu is limited but the dishes are well-prepared, and the ambience and welcome are warm and friendly. Snag an outdoor cafe table on market day at any of the Luberon hill towns, order a cafe creme and enjoy the people-watching! Skip the meal, the drop-dead gorgeous view across the Luberon is the reason to have a drink at the Cafe de France in Lacoste. You can’t beat the busy markets at Apt (Saturday) or Lourmarin (Friday). You’ll find beautiful local produce, meats, cheeses and bread for your picnic. Those looking to bring back gifts and souvenirs won’t lack for options: soap, pottery, jewellery, clothing, housewares, hats and much more. 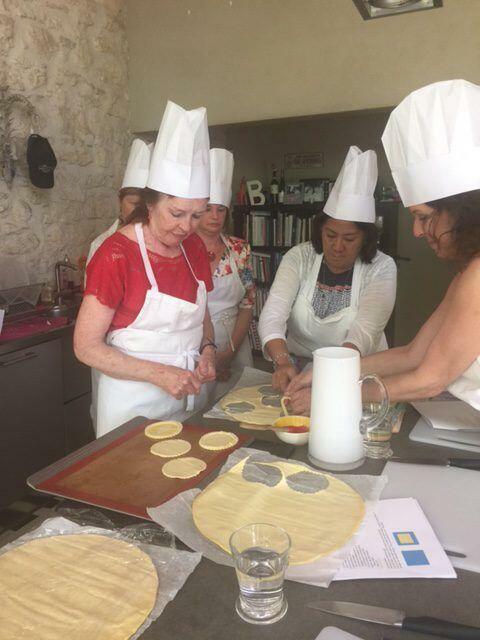 Margotulle sells upscale straw hats of his own design from his atelier in Saignon and is often at the market in Lourmarin. Tempted by the 48-hours in the Luberon? Or better yet a longer trip? Here is a Goût et Voyage sample itinerary.